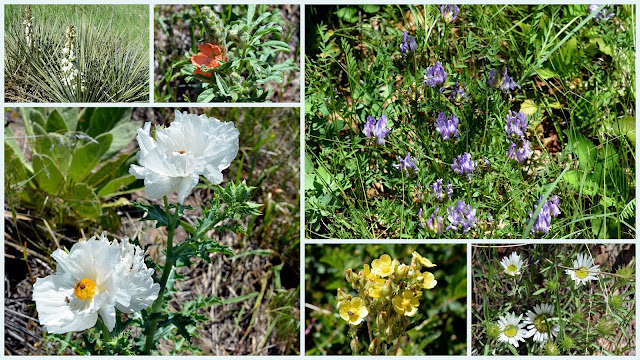 I'm back to blogging about Colorado after many posts about our trip to Italy--you can see those posts under this label "Italy" Meanwhile, Spring came slowly to our home state of Colorado. Our high elevation above sea level means that we can receive snowfall until the end of May. Colorado is the only U.S. state that lies entirely above 3,280 feet (1000 meters) in elevation. Our climate is considered 'high desert" so our low humidity and hot sun often make temperatures feel warmer than the thermostat reads during the day, while evening and night temperatures are cool. It is not unusual to see snow at the highest elevations right up until the end of June, although snowpack this winter was less than normal in many places, and many of those high elevations are now open to driving and hiking. Springtime means the new fawns are being born and the bucks are re-growing their antlers. 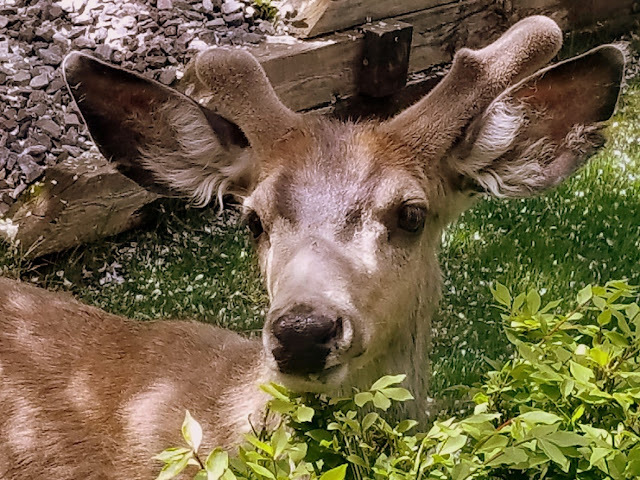 This buck was right outside our kitchen window! ...all along the Front Range of Colorado. ..as well as to our front yard garden! 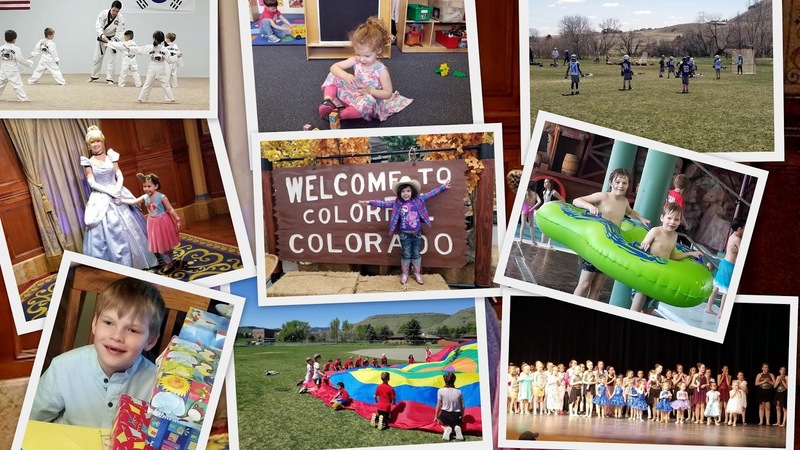 The best part of springtime in Colorado for me was spending quite a bit of time with my grandchildren and enjoying all their activities. Taekwondo, lacrosse games, school field days, birthday celebrations, dance recitals, preschool graduation, rodeo day, and pool time! It has been a fun and busy time for all of us, with more fun occasions ahead as the summer arrives. I hope that you have been having a wonderful Spring! What has been your favorite moment? My husband's cousin was our tour guide this day, showing us his favorite places in his hometown. 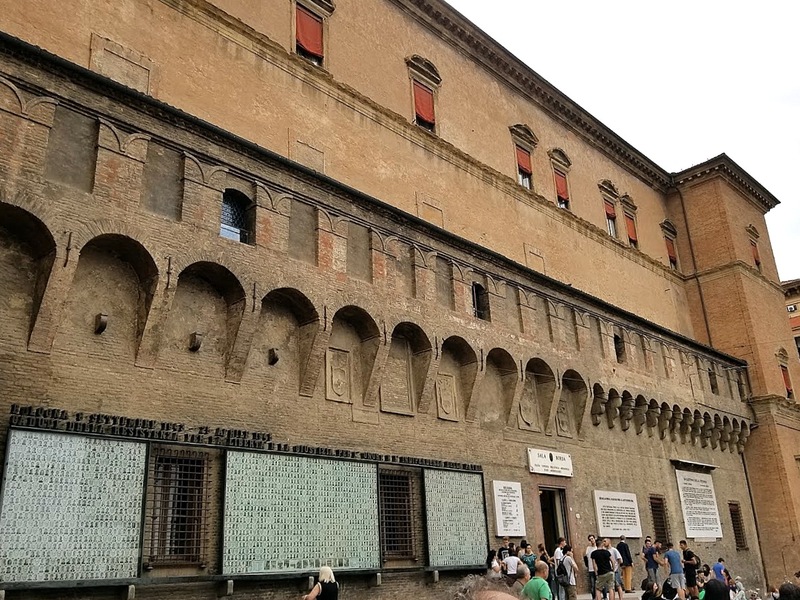 One of our stops was to Palazzo Pepoli Campogrande. 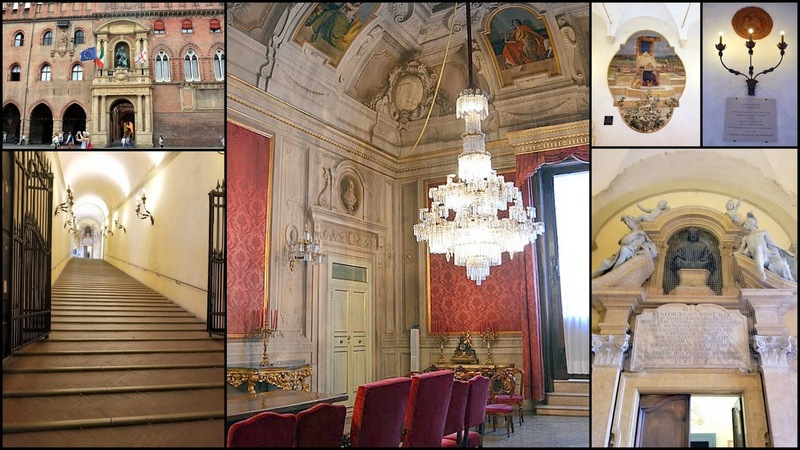 The palace was built in the mid-1600's for Count Odoardo Pepoli of the aristocratic Pepoli family. 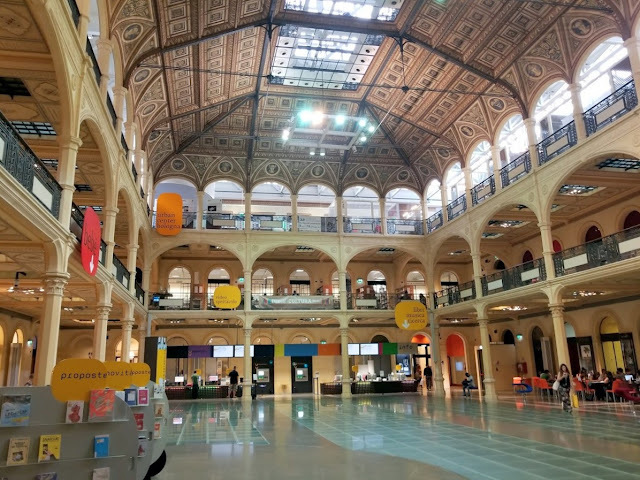 Now it is a museum and "Museo della Storia di Bologna (Museum of the History of Bologna), recounting the history, culture, and transformations of Bologna, from 'Felsina etrusca' to modern times. I was amazed by the beauty and opulence of the palace's rooms! 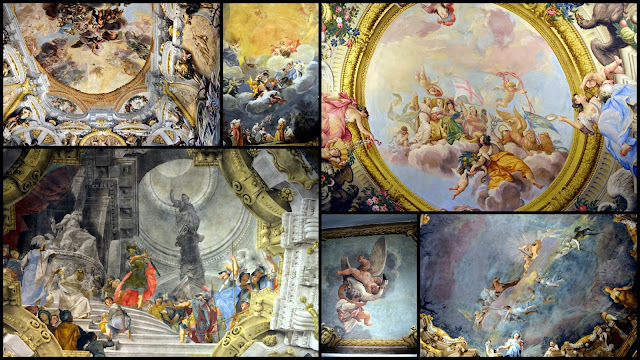 The ceilings of many of the rooms contained magnificent frescos! 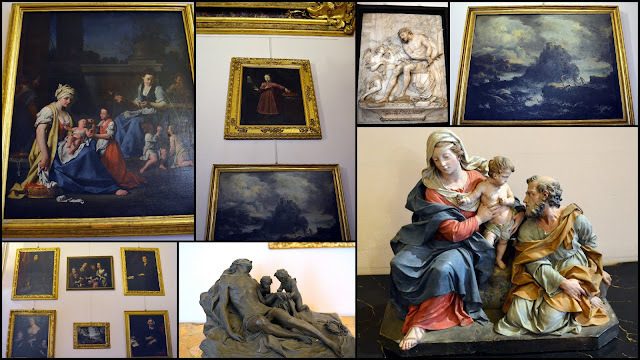 We especially enjoyed seeing the baroque era artwork and sculptures in the museum! The basilica has the nickname "Sette Chiese," which means seven churches. According to tradition Saint Petronius, a bishop of the city during the 5th century built the basilica over a temple of the goddess Isis. The saint wished to have a building that recalled the Church of the Holy Sepulchre in Jerusalem. Only four of the churches remain intact today: Chiesa del Crocefisso, Chiesa della Trinità, Chiesa del Santo Sepolcro and Santi Vitale e Agricola. You can see their layout in the photo of their model above. The churches within Santo Stefano have an architecture that spans centuries of Bolognese history and incorporates Romanesque, Lombard, and even ancient Roman elements. Some of the ancient frescos inside the chuch. 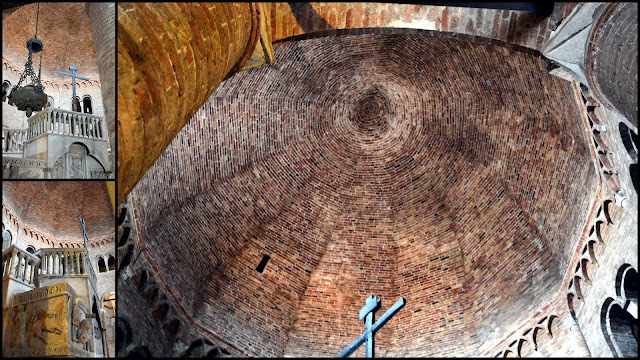 I was particularly fascinated by the octagonal brick ceiling of Chiesa del Santo Sepolcro, within the basilica. 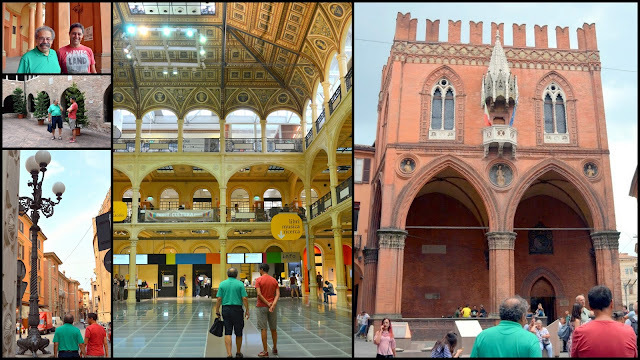 Enlarge the photo collage above, by clicking on it, to see how it is made of painstakingly placed small red bricks. As we walked through the central streets of Bologna, high towers caught our attention. 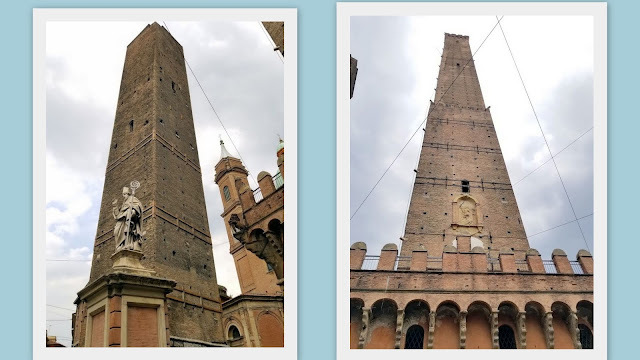 Our cousin told us that once Bologna had many towers. Between the 12th and the 13th century, the number of towers in the city was plentitude. The reasons for the construction of so many towers are not clear, but one hypothesis is that the richest families used them for offensive/defensive purposes, or to indicate their wealth. Most have collapsed or were taken down over time, but about 20 in all remain. Two prominent towers that remain are referred to as the "Two Towers'" and are landmarks in the city. 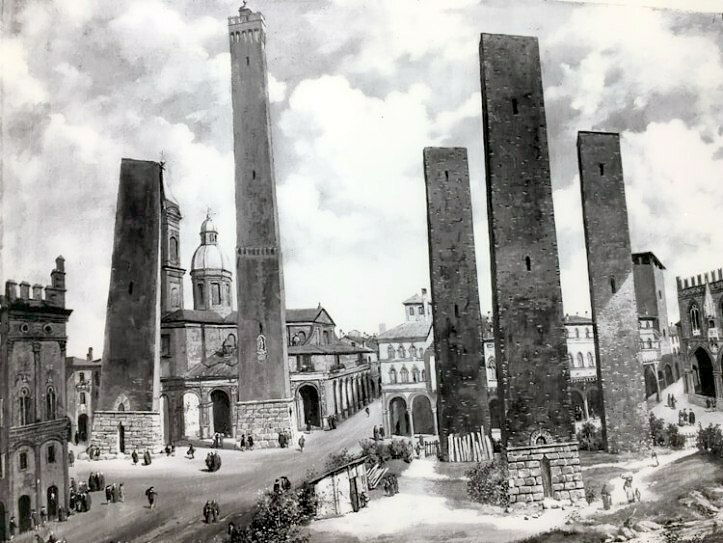 The taller tower is called the Asinelli (on the right in the photo above) while the smaller but more leaning tower is called the Garisenda. 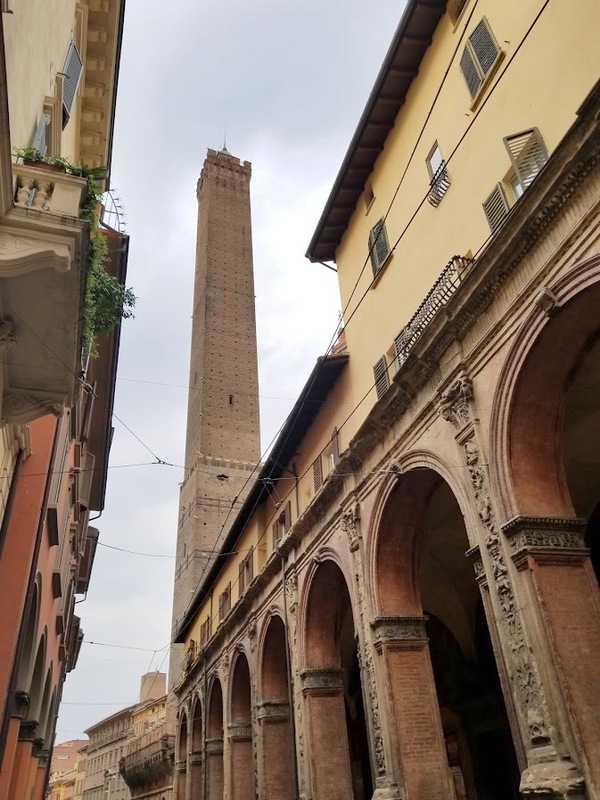 The Asinelli Tower was built between 1109 - 19 by the Asinelli family, and in the following century, it was acquired by the Municipality of Bologna. It is 319 feet (97.20 meters) high and has an inner staircase of 498 steps which were completed in 1684. It is the tallest leaning medieval tower in the world! The bottom of the tower is surrounded by a small building built in 1488 to house the guards. There is an admission fee to climb to the top of the tower, and although I was tempted to do so to see the view, I did not want to obligate our cousin to do something he has done often before. You can see a video of the view from the top of the tower here. 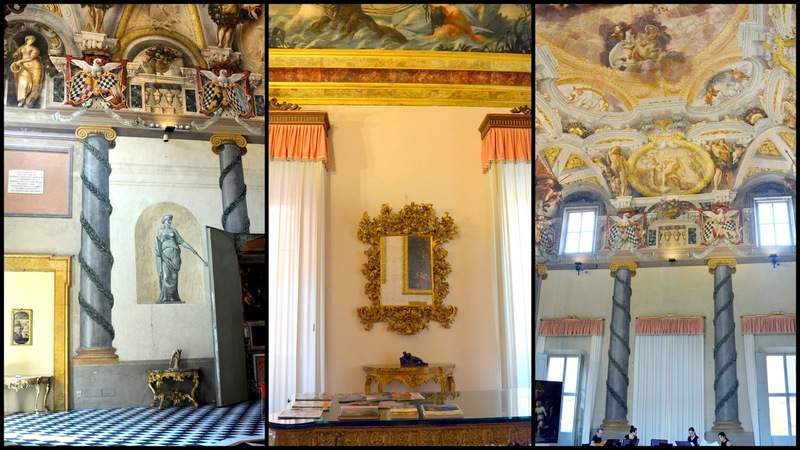 We visited the Palazzo d' Accusio which was ornately decorated inside. Our cousin explained that the staircases were built on such a slant to accommodate horses climbing them, as dignitaries of the past used to arrive on horseback. I found this print in the town hall of a view of Bologna from the air very interesting! The Piazza Del Podesta is also located in the Piazza. Constructed in the 1200's as the first seat of the local government it is now a civic building. The Fountain of Neptune, located near the Piazza. 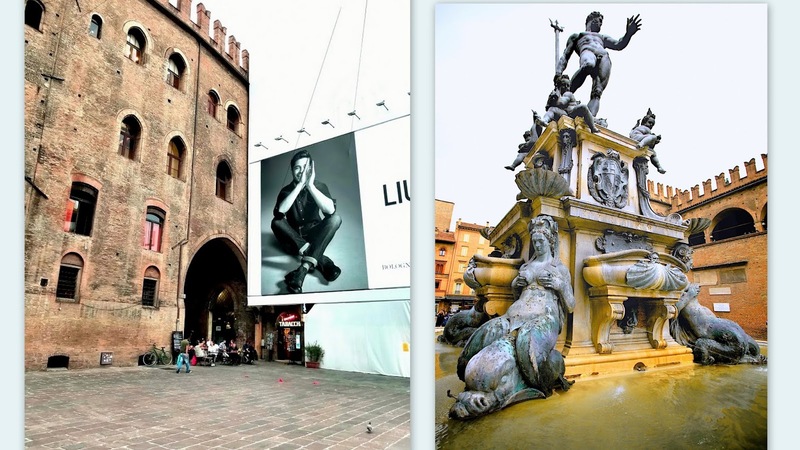 This famous fountain by Flemish sculptor Giambologna was built in 1564. The fountain had a practical function as it was used by the citizens to collect water. Unfortunately, it was being renovated during our visit last summer and was completely surrounded by scaffolding and screens (left side of photo collage), so I included a photo from Wikipedia to show its appearance. The Basilica of San Petronio dominates one side of the Piazza Maggiore. It is dedicated to the patron saint of the city, Petronius, who was the bishop of Bologna in the 5th century. It is the 10th largest church in the world. Construction of the basilica began in 1390. 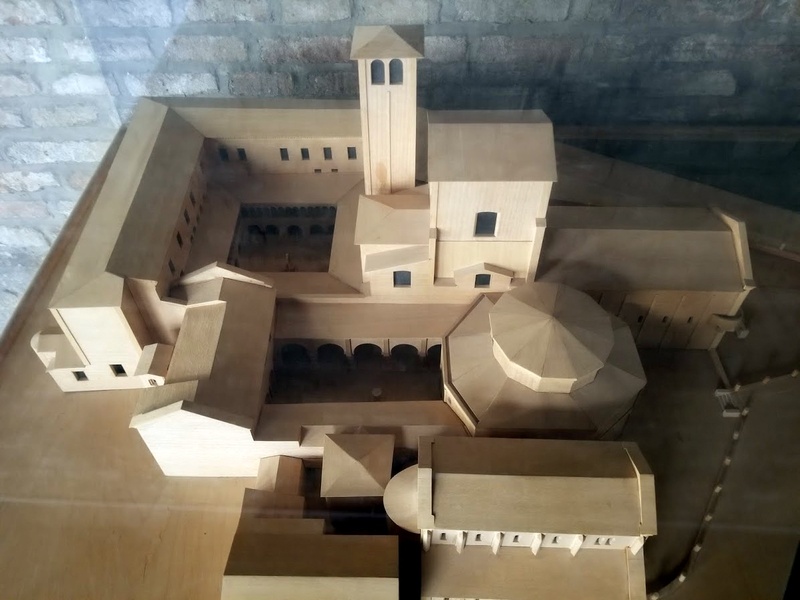 It was supposed to become the largest church of the Christian world, but that plan had to be abandoned because Pope Pius IV did not like the idea of a church bigger than St. Peter’s in Rome. The Basilica of San Petronio is unfinished, which is obvious when you look at the façade: the bottom part features white and red marble, but the upper part is just comprised of bricks. 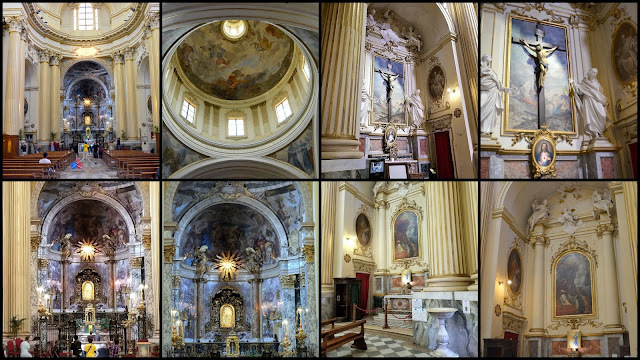 Some views of the beautiful and grand interior of the church. After I took these few photos I found out that photos were not allowed inside the basilica without first paying a fee, so I closed my camera. 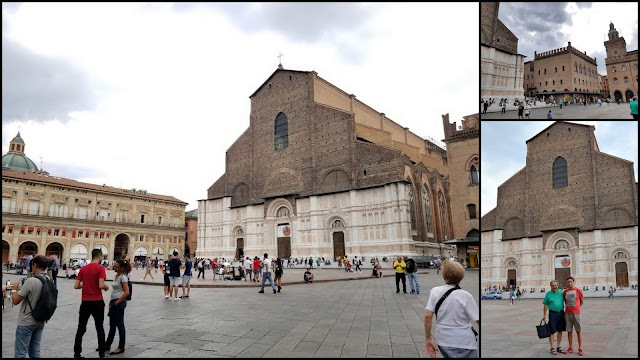 Our cousin told us that the basilica is guarded daily by the Italian Police because in 2002, five men connected to Al Qaeda, had planned to blow up the basilica and were arrested. 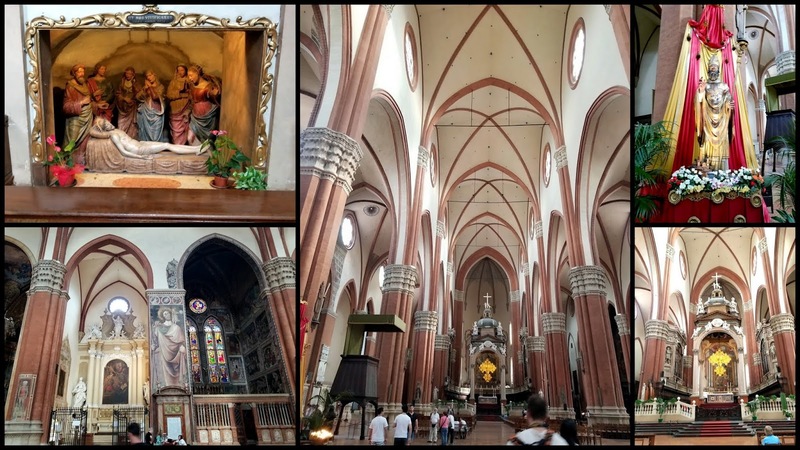 In 2006, another plan by terrorists to destroy the Basilica was also thwarted by Italian police. The terrorists claimed that a 15th-century fresco inside one of the 22 chapels inside the basilica was insulting to Islam. That evening we enjoyed a delicious dinner with our cousin and his family at a local restaurant that served traditional Bolognese cuisine. 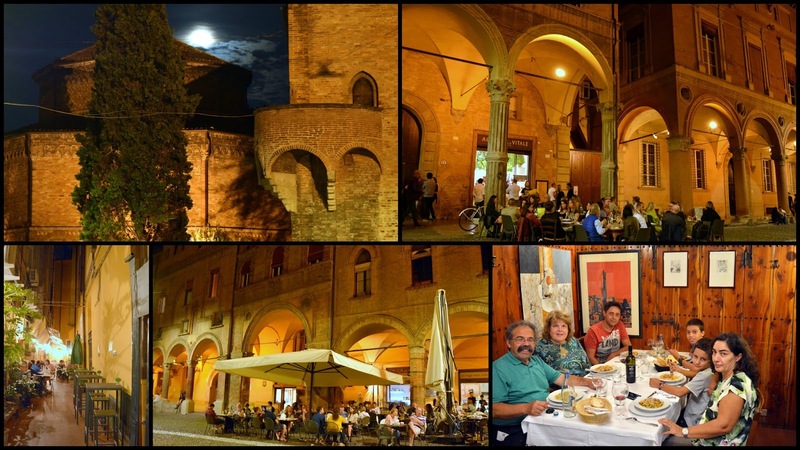 The city of Bologna looked gorgeous under the moonlight! We returned to Genoa the next morning and began our journey back to the United States soon after. Our time in Italy had come to an end, but we were happy to have seen and experienced so much on this visit and to have spent so much time with my husband's extended family. We thank them and hold them all in our hearts and memories until we see them again on our next trip! Meanwhile, the end of the school year here in Colorado has had us busy with many grandchildren events! Graduations, recitals, sports, competitions, field days --- stayed tuned for my next blog post! Bologna has three nicknames: “La Rossa" --"The Red" – for its ochre colored roofs and terracotta walled buildings, plus its traditional political leanings. 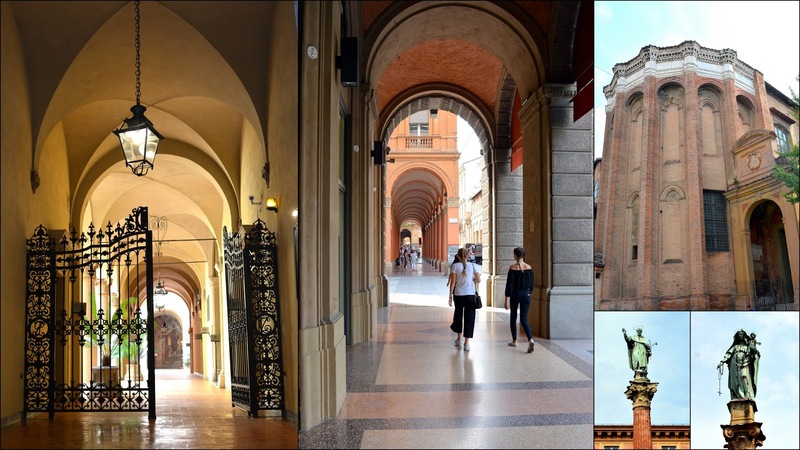 “La Grassa”-- "The Fat" – for its rich cuisine, and “La Dotta” --"The Learned" – as its renown university is the world’s oldest. 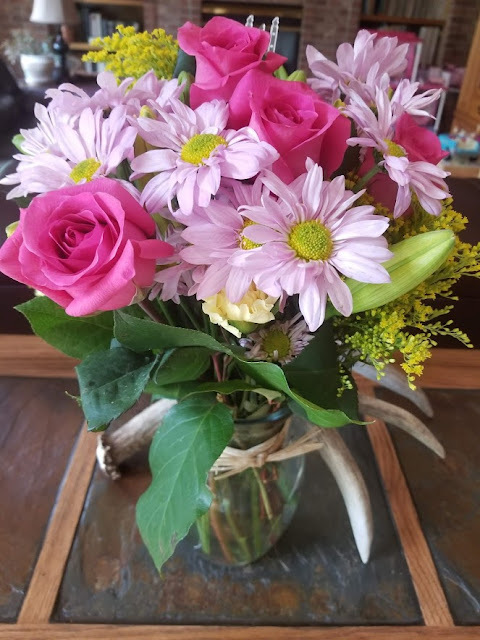 I hope to show you some of the ways it has earned these names in this post. Bologna is definitely an interesting city to visit, and much less touristy than most of Italy, which makes it even more enjoyable. 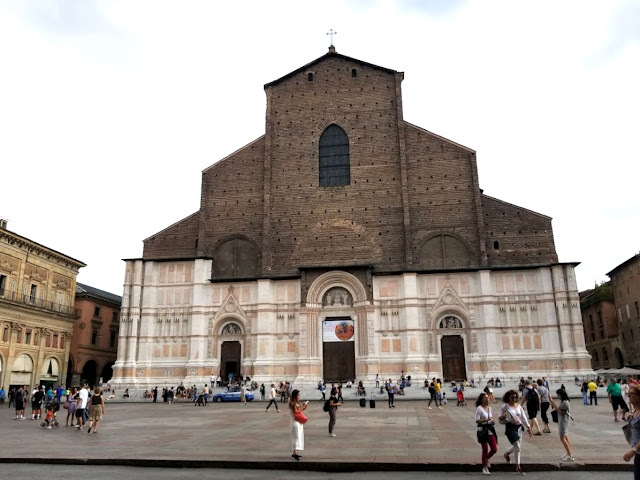 Bologna could also earn the nickname "Molte Chiese"--" Many Churches" -- as there are many magnificent churches located in the city, and they are always a focal point. 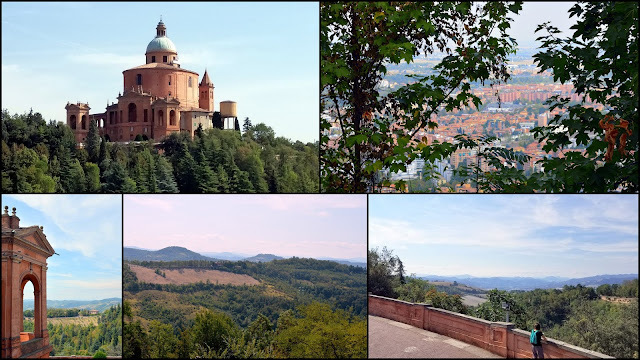 About 2.17 miles (3.5km) southwest of the city center, on the forested hilltop of Monte della Guardia, is the Basilica Santuario della Madonna di San Luca. It occupies a powerful and appropriately celestial position overlooking the red-hued city below and is dear to the Bolognese, as it is visible for miles. The 18th-century sanctuary is connected to the city walls by the world's longest portico, held aloft by 666 arches, beginning at Piazza di Porta Saragozza. 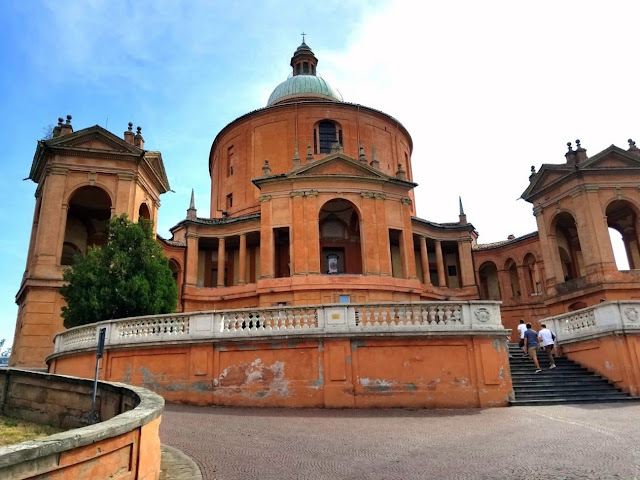 As our visit to Bologna was limited, our cousin drove us to the top of the hill, instead of having us walk up to the top through the portico, but I would advise trying to take the walk up through the winding archwayed portico if one has the time. Some views of the beautiful interior of the basilica. 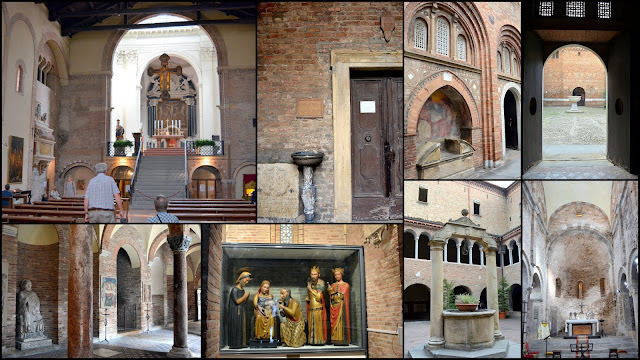 The church houses a "black" representation of the Virgin Mary, supposedly painted by St. Luke and transported from the Middle East to Bologna in the 12th century. 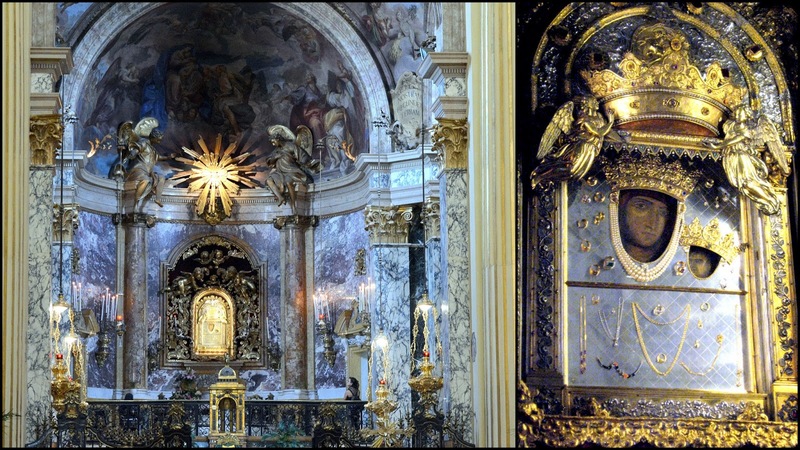 You can see the miraculous icon's position over the main altar of the left of the collage above and a close up on the right. 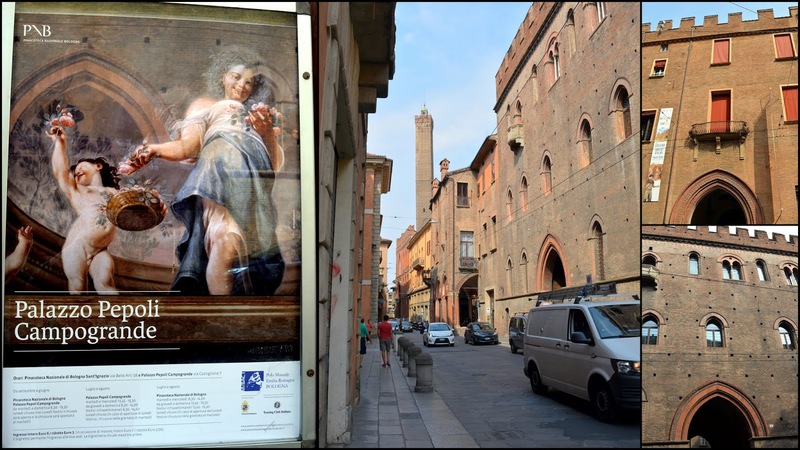 Since the year 1433, a yearly procession takes place that transports the Byzantine Madonna and Child to the Cathedral of San Pietro in the city center, during Ascension week. The views from the hilltop where the basilica sits are amazing! 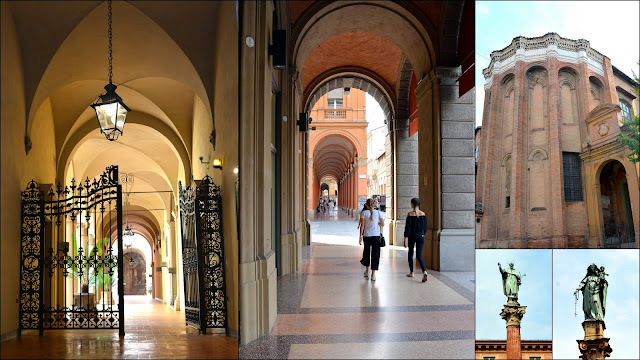 The "La Rossa" -- "The Red"-- can be seen in the red rooftops of the city of Bologna below. The Red of Bologna is also a reference to its political left-leaning that dates all the way back to Roman times. In World War II it was the center of the anti-fascist movement and it was a stronghold for Italy's Communist party for decades. 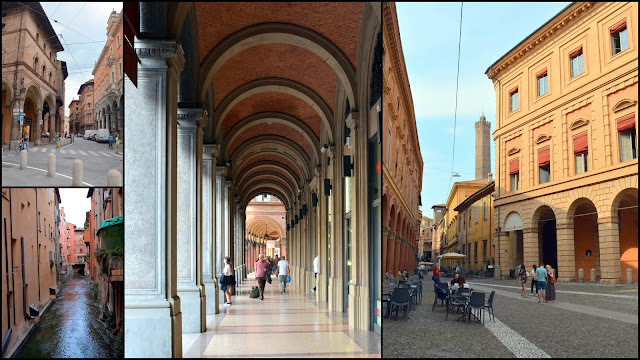 For Bologna's nickname "La Gasse" --" The Fat" -- one has to visit the “Quadrilatero” area located off the Piazza Maggiore, the main square in the central district of the city. The Quadrilatero is an area of very narrow streets with packed vendors and old food stalls. 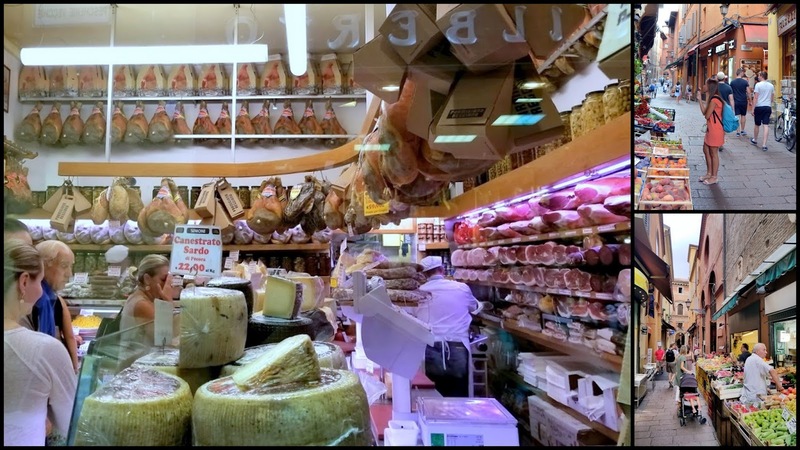 There you can find butchers, fresh pasta, wine shops, greengrocer’s, bakeries, cheese stores, fish stores, and shops with traditional cuisine and crafts. Many of these shops have also preserved the historic architecture and furnishing, making them extra scenic and quaint. Click on to enlarge the photo collage above to enlarge it to get an idea of the wonderful fresh foods available in the markets, I was especially intrigued by the different varieties and sizes of tortellini, the favorite pasta of Bologna. 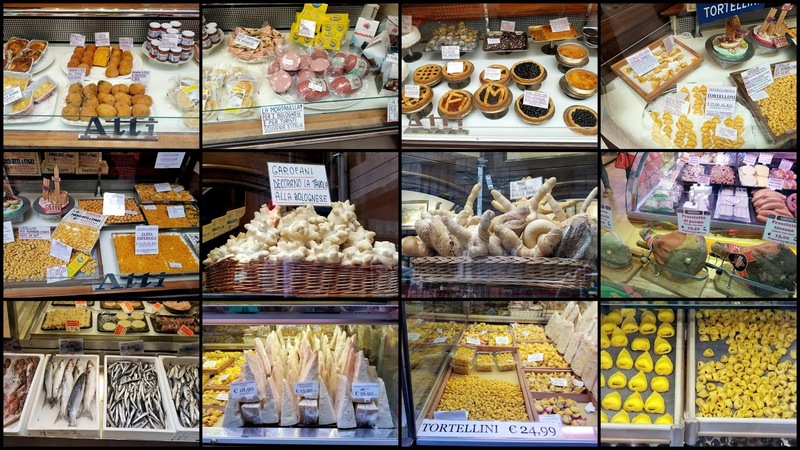 Later we would have dinner at a traditional Bolognese restaurant with our cousin and his family, and we'd enjoy some of that delicious tortellini! 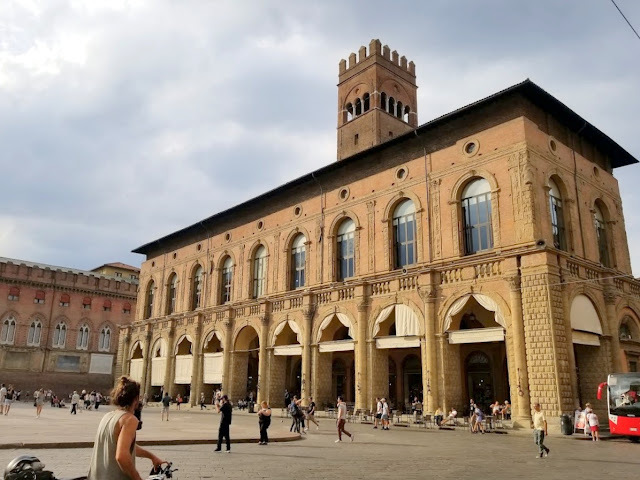 "La Dotta" -- "The Learned" -- begins in the Palazzo Poggi -- the headquarters of the University of Bologna and of the rector of the university. 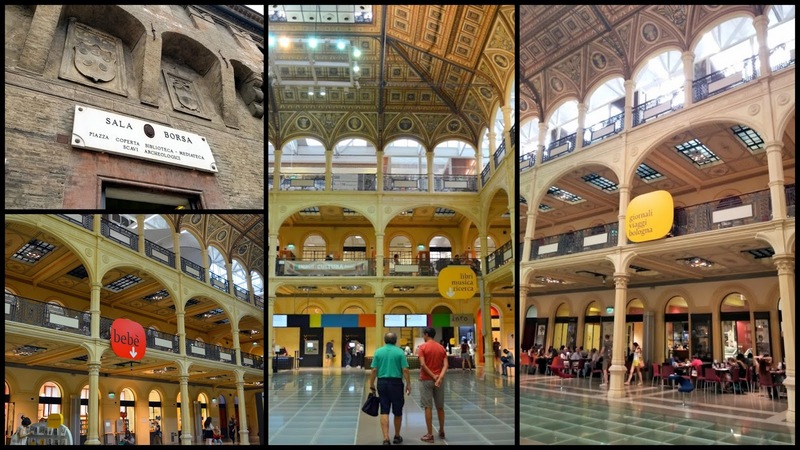 The university was founded in 1088 and is the oldest university in continuous operation as well as one of the leading academic institutions in Italy and Europe. Many illustrious alumni attended the university through the ages, from Dante, Petrarch, and Erasmus, to four popes. 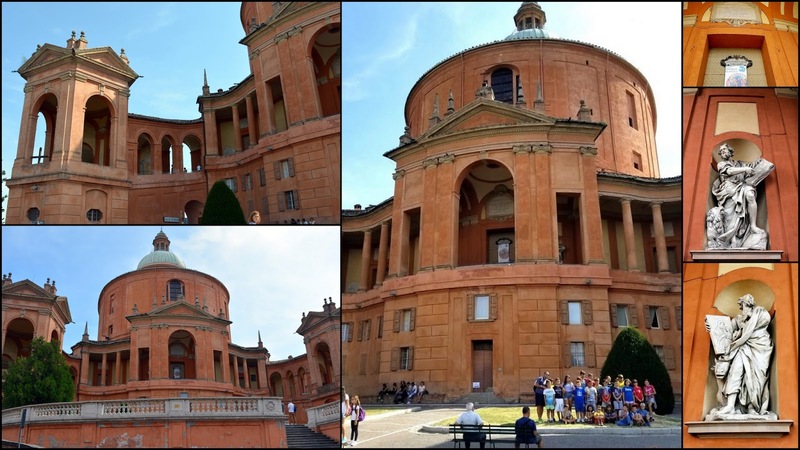 The palace was renovated in the middle of the 16th century and it was chosen by Napoleon as a new seat of the University of Bologna in 1802. 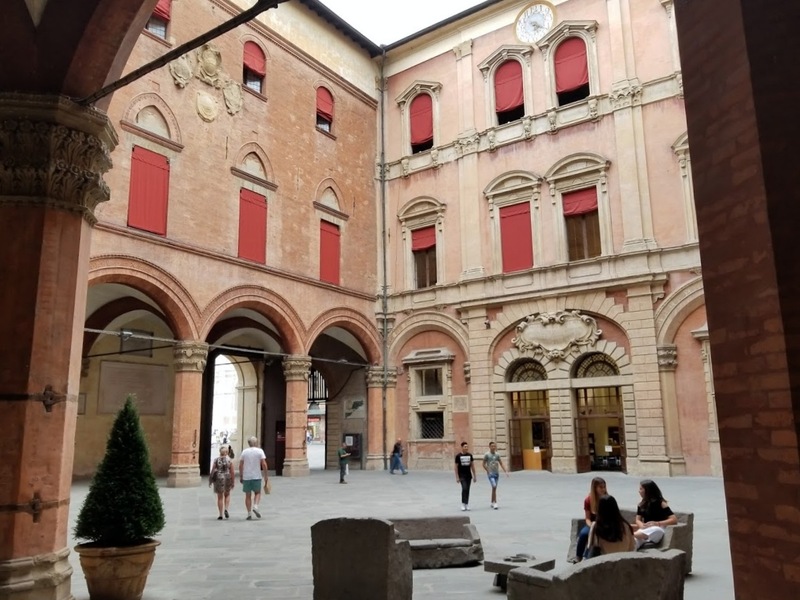 Our cousin felt we'd also be interested in seeing the Salaborsa Library, a magnificent free public library inside what was once the Palazzo d'Accursio. The library is very impressive! It houses over 300,000 books, 70,000 of which are for children and young adults. There are 30 newspapers, domestic and foreign plus over 300 different magazines, an extensive collection of books in a foreign language, CD's, DVD's, CDROMS, Maps, ebooks and free WiFi. 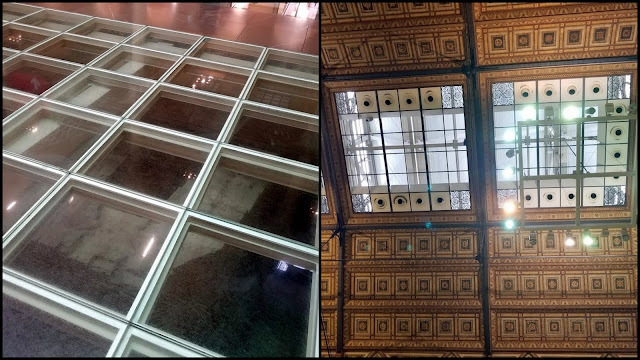 Sections of the main floor of the library revealed archeological excavations of ancient artifacts from past centuries that lie beneath the foundation of the building. The skylighted ceiling allows for a flood of natural light. 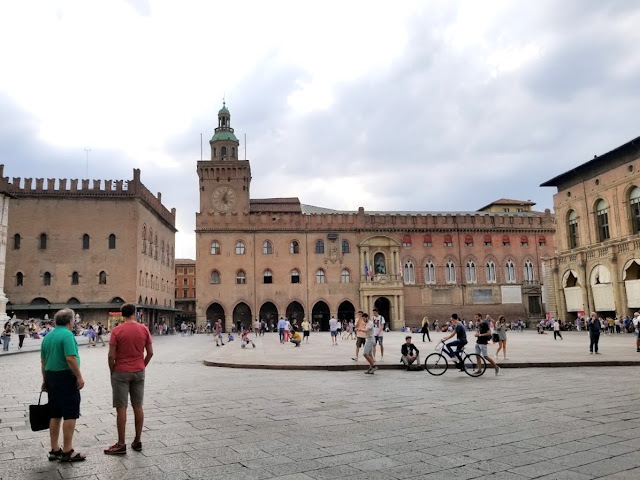 There is more to share of our visit to Bologna, including the city's own leaning tower, and a church with a controversial mural that requires police protection, all of which I'll share on my next post.